The name occurs three times in the Old Testament: (1) In Judges, vii. 22 it is stated that Gideon followed the Midianites as far as the "lip" of Abel-meholah under (i.e., near) Tabbath. It has been conjectured that this "lip" is the bank marking the edge of the Jordan valley. (2) In I Kings, xix. 16 it is mentioned as the home of Elisha. (3) In I Kings, iv. 12 it appears as one of the limits of the province assigned to Baana, the son of Ahilud, one of Solomon's officers. It is highly probable also that Barzillai the Meholathite (I Sam. xviii. 19, II Sam. xxi. 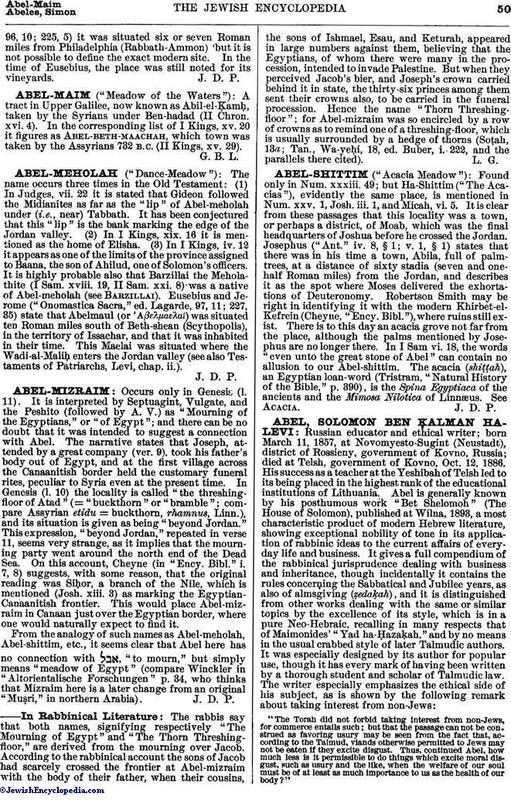 8) was a native of Abel-meholah (see Barzillai). Eusebius and Jerome ("Onomastica Sacra," ed. Lagarde, 97, 11; 227, 35) state that Abelmaul (or 'αβελμαελαί) was situated ten Roman miles south of Beth-shean (Scythopolis), in the territory of Issachar, and that it was inhabited in their time. This Maelai was situated where the Wadi-al-Maliḥ enters the Jordan valley (see also Testaments of Patriarchs, Levi, chap. ii. ).